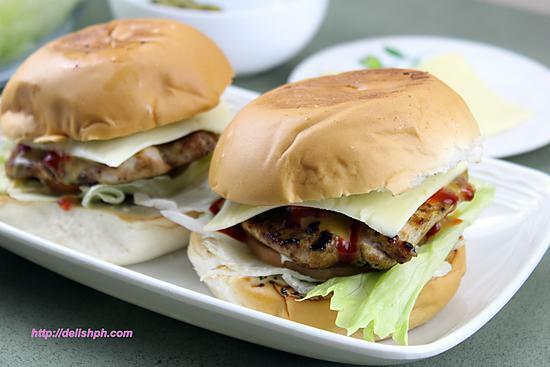 If you don’t eat pork nor beef, then you can try this easy delicious Grilled Chicken Burger. 1. Combine all the spices in a bowl. Garlic powder, onion powder, celery powder, chili powder, salt and pepper. 2. Rub it all over the chicken breast fillet. 3. Heat the grillpan. And grill both side. Before taking the chicken out of the pan, grill the burger buns too. 4. Start preparing your sumptuous grilled chicken burger. Bun>Lettuce>slice of tomato>mayonnaise>chicken>pickle chips>mustard>ketchup>cheese>bun.